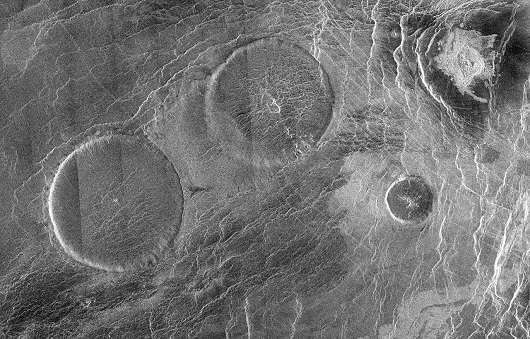 The long-standing mystery of why there are so few volcanoes on Venus has been solved by a team of researchers led by the University of St Andrews. Dr Sami Mikhail of the School of Earth and Environmental Sciences at the University of St Andrews, with colleagues from the University of Strasbourg, has been studying Venus – the most Earth-like planet in our solar system – to find out why volcanism on Venus is a rare event while Earth has substantial volcanic activity. Dr Mikhail's research revealed that the intense heat on Venus gives it a less solid crust than the Earth's. Instead, Venus' crust is plastic-like – similar to Play-doh – meaning lava magmas cannot move through cracks in the planet's crust and form volcanoes as happens on Earth. Instead the magma gets stuck in this "squidgy" planetary layer. This soft crust also prevents tectonic plates forming as they do on Earth – a geological phenomenon which plays a very important role in Earth's carbon cycle and is crucial to Earth's climate. Establishing why these two sibling planets are so different, in their geological and environmental conditions, is key to informing on how to find 'Earth-like exoplanets' that are hospitable (like Earth), and not hostile for life (like Venus). Dr Mikhail said: "If we can understand how and why two, almost identical, planets became so very different, then we as geologists, can inform astronomers how humanity could find other habitable Earth-like planets, and avoid uninhabitable Earth-like planets that turn out to be more Venus-like which is a barren, hot, and hellish wasteland." Based on size, chemistry, and position in the Solar System, the planet Venus is the most Earth-like planet observed so far. But while Earth is the crucible of life, Venus has no life and extreme high temperatures of up to 460 degrees centigrade. The intense heat is a consequence of Venus being slightly closer to the Sun than the Earth, and because Venus is enveloped by a massive greenhouse atmosphere dominated by carbon dioxide. "Instead the magma gets stuck in this "squidgy" planetary layer." Scientific explanation at its best!! Save us - please - from excessive over-simplification. 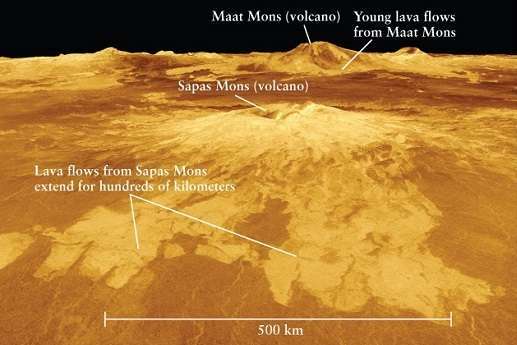 So how come the graphic shows volcanoes (Maat Mons and Sapas Mons) on Venus' surface?